It came as a bit of a surprise to see Frances Jupurrula Kelly on screen in the documentary Coniston (PAW Media, 2012). For one thing, I’m not used to documentaries that include the story of their creation as part of the film–but more about that later. For another, even though I should know better, it’s hard to think of the irrepressible comedian of the Bush Mechanics as a sombre elder, even though fifteen years have passed since Jupurrula debuted his story of mechanical ingenuity in the desert. And certainly the scope of Jupurrula’s accomplishments with PAW Media have assured his status not only among Warlpiri but nationally and internationally. If we can’t seem to shed the distinction between “remote” and “urban” artists in the the visual sphere, Jupurrula’s career as a filmmaker is proof of how little such distinctions truly matter. The Coniston massacre, which took place from 14 August to 18 October 1928 near the Coniston cattlestation, Northern Territory, Australia, was the last known massacre of Indigenous Australians. People of the Warlpiri, Anmatyerre and Kaytetye groups were killed. The massacre occurred in revenge for the death of dingo hunter Frederick Brooks, killed by Aborigines in August 1928 at a place now known as Yukurru, (also known as Brooks Soak). Official records at the time stated that 31 people were killed. The owner of Coniston station, Randall Stafford, was a member of the punitive party for the first few days and estimated that at least twice that number were killed between 14 August and 1 September. Historians estimate that at least 60 and as many as 110 Aboriginal men, women and children were killed. The Warlpiri, Anmatyerre and Kaytetye believe that up to 170 died between 14 August and 18 October. Wikipedia presents much more detail on the events leading up to the Massacre, as well as on the trial of two Aboriginal men for killing Brooks, and the inquiry into the actions of Constable William Murray, who was sent from Alice Springs and who led the killing parties that took revenge for Brooks’s death. Much of this material is also presented in the film. What makes the film fascinating is the manner in which the story is told and the subtleties that emerge from hearing the story told from the Warlpiri point of view. Jupurrula, here collaborating once again with fellow Bush Mechanics writer and director David Batty, has recreated the central events of the massacre story in a dramatic fashion. Led by David Field as Brooks, Elijah Japanangka Jones as the killer, Bullfrog, and Fiona Nungarrayi Kitson as Napurrula’s Bullfrog’s wife and the Trojan Helen of this tragedy, a cast in many cases descended from the survivors of the massacre re-enact the story of Warlpiri pushed in by drought to the edges of the Coniston station, the subsequent killing of Brooks, and the massive slaughter of Aboriginal people by Murray and his men in retaliation. Layered atop this dramatization are interviews with the survivors and close, elderly kin who tell the story as they witnessed it or as it has been passed down to them through family members close to the events. This sort of docu-drama has become an increasingly popular form of historical narration in recent years and is highly effective at enhancing both the documentary and the dramatic aspects of the storytelling. But Jupurrula and Batty have another trick in store for us. Taken together, these three interwoven threads create a rich portrait not just of the events of 1928, but of the persistent resonance those events have for Warlpiri today. This is truly living history, and there should be no doubt by the film’s end that the breath of that history still suspires in the desert of the 21st century. We are often told that the tjukurrpa inhabits every moment of time, that the distinction between time past and time present is minimal. As we watch the descendants of those who survived the massacre enact the story, that distinction between generations is blurred and a new identification, and the meaning it encompasses, is revealed to us as audience. And thus, when the old folks in the film’s documentary interviews talk about how they don’t return to that country even now, more than eight decades later, we understand not the weight of history, but its living presence in the landscape. 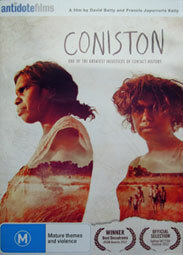 Coniston is a marvel of contemporary Indigenous filmmaking. Much of the credit for this must go to Jupurrula, who has wrestled with this material for a long time. In one section of the new film, footage from a project that Jupurrula undertook in the 1980s is included, in which he interviews George Japangardi Marshall, Bullfrog’s son, at the site of the Brooks’s murder and on other locations important to the story. According to Eric Michaels, who retells the making of that earlier film in the 1987 essay “For a Cultural Future: Francis Jupurrula Makes TV at Yuendumu” (reprinted in Bad Aboriginal Art, University of Minnesota Press, 1994), this was Jupurrula’s first video and like Coniston, is shot through with subtle evocations of relatedness, country, and family. Comparing that footage of old Japangardi telling the story with Coniston, it is easy to assess the growth in Jupurrula’s artistry over time: the mastery of drama is evident, and the quality of his documentary interviews has matured as well. Jupurrula’s ability to frame shots, to make each individual he speaks with an interesting character full of a range of emotions and memories is remarkable. The story is complex: Bullfrog is not hero or anti-hero; he’s flawed and foolish and the Warlpiri aren’t entirely sympathetic to him. And there are really many stories here, a braid of oral tradition that Jupurrula weaves together with great skill so that you can appreciate the differences among the accounts, and yet come away with a coherent understanding of what took place and how it affected those involved. The acting is also superb, especially Fiona Nungarrayi Kitson’s portrayal of Napurrula in the scenes where she interacts with Brooks at his campsite. She demonstrates shame, simpler embarrassment, amusement, fear, impatience, and curiosity in equally convincing measures. If she’s not on the nomination list for a Deadly this year, then there’s some explaining to be done. There’s a rich trove of supporting material on the PAW Media website devoted to the film, including maps, references to published histories, profiles of the participants in the film, reviews, and much more. The film is available from the ABC Shop online, and clicking on the image below will link you to the trailer on Vimeo. Although viewing Coniston takes an hour, its riches can absorb you for much longer. The investment is well worth it. This entry was posted in Film and tagged Coniston Massacre, Francis Jupurrula Kelly, PAW Media, Warlpiri. Bookmark the permalink. In June 2010, the Film and Television Studies program at Monash University and the Australian Centre for the Moving Image (ACMI) co-hosted a national symposium celebrating three decades of Australian Indigenous community filmmaking. The occasion for this event was the DVD release of the internationally acclaimed Indigenous community film Two Laws (1981), produced thirty years earlier by the Borroloola Aboriginal Community with independent filmmakers Carolyn Strachan and Alessandro Cavadini. Two Laws was not the first project of this kind in Australia, but its unique and highly innovative representation of Indigenous history and culture based on the Borroloola peoples’ oral storytelling tradition was without precedent at the time of its production, making it a landmark work in documentary cinema both in Australia and around the world. Thanks for the tip, Jeni. I snagged what they claimed was the last copy on Amazon this morning!